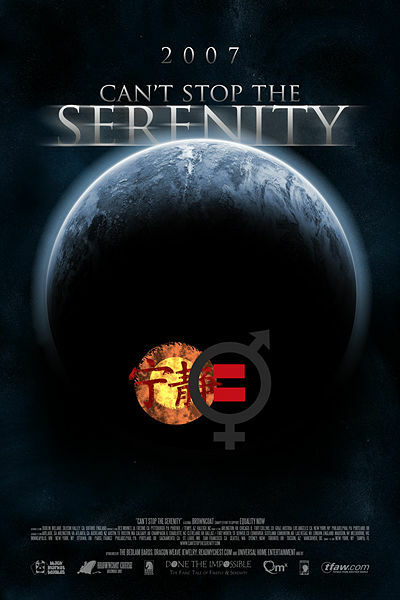 Melbourne’s 2007 “Can’t Stop the Serenity” charity event raised US$1,495 for Equality Now! For the second year, Ian “Maddog” Morgan and his dedicated team of volunteers took up the challenge to host a “Can’t Stop the Serenity” event in Melbourne! A big thank you to all volunteers and attendees!! We got to see “Serenity” on the big screen, saw some fantastic costumes, auctioned some very cool prizes (including items signed by Joss Whedon, Jewel Staite and Sean Maher) and give away some great prizes in the raffle.